Laxmi Vilas Palace is a reflection of Royal heritage of Jat rulers. From a Royal Palace to a heritage hotel, Laxmi Vilas Palace has become a great attraction in the small town of Bharatpur. It is a premium heritage hotel just 1 kilometer away from Bharatpur Bird Sanctuary. The hotel offers accommodation in two wings with 75 rooms divided into two categories- Classic Rooms and Royal suites. The rooms are spaciously steeped in heritage theme with all the basic modern amenities and attached bathroom. The spectacular restaurant and bar would be perfect for a wine and dine evening with your family. Enjoy the mouthwatering food with lavish drinks. One can also spend leisure time by poolside, in the courtyard with a cup of tea, in the lush green gardens, or by the snooker table. Laxmi Vilas Palace is an out-in-out heritage experience. Both the accommodation wings offer guests a truly royal experience with rooms overlooking the large garden area. It is a popular standalone gateway. It maintains the architecture and values of royal families. After a tiring day, guests can relax and revitalize at the spa and relaxation center. Sightseeing excursion in and around the city also attracts the guests. unwind and enjoy the beauty ofnature with a touch of royalty! The Kingdom of Bharatpur was carved out by the legendary Jat warriors, Badan Singh and Suraj Mal. Under theirable leadership the territory of Bharatpur expanded far beyond the original boundaries of the town of Bharatpur and the Jats became a power to be reckoned with in this region. Such was the might of the Jats that Bharatpur came to be known as the impregnable city. The forces of Bharatpur were the only ones which fought successfully against the British. In the unsuccessful siege of the Lohagarh fort, the British forces led by Lord Lake suffered heavy casualties and Lord Lake himself was killed. At Deeg, the Bharatpur Maharaja's men successfully took on the might of combined Mughal and Maratha army of 80,000. Growing from strength to strength, the Jats even attacked and cakptured the Red Fort in Delhi, the ultimate seat of Power! Set amongst a sprawling 50 acres, the Laxmi Vilas Palace Heritage Hotel was built in 1857 for Raja Raghunath Singh, the younger brother of then-ruler of Bharatpur, Maharaja Ram Singh son of Maharaja Jaswant Singh. An eclectic and lively fusion of Rajput and Mughal architecture, the place was earlier called Raghunath Niwas, though the locals always preferred to call it Kakaji Ki Kothi. 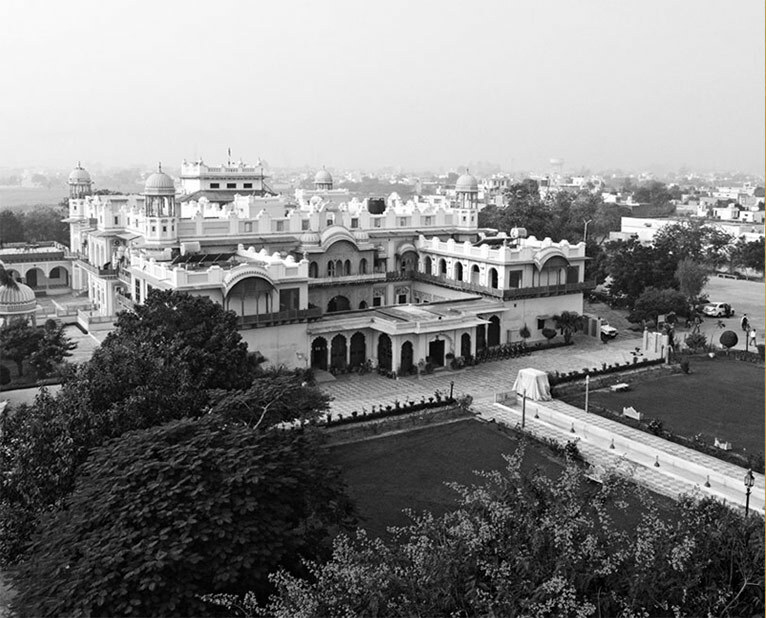 For almost a hundred years, the Laxmi Vilas Palace has been a prime witness to, and a participant in almost every eventful happening that took in the princely state of Bharatpur - Royal weddings, affairs of the court and the Royal duck shoots. It has played host to such dignitaries as the Duke of Edinburgh, Shah of Iran, King of Nepal and Shah of Afghan. There was of course enough to entertain those who entered the portals of the Palace. Feasts and festivities lasted for days, and the Palace kitchen ensured that the only gourmet cuisine arrived at the dining table. The same traditions of hospitality have been kept alive till the present day. In 1994, a decision was taken to convert the palace into a hotel. The Laxmi Vilas Palace has been operational ever since. Though the Laxmi Vilas Palace is now a premier heritage hotel, it is first and foremost a Royal residence with the family of Raja Raghunath Singh ji staying in the Palace. Even today the traditional pujas and ceremonies, especially of Dussehra and Diwali, take place in the ceremonial rooms. While restoring and refurbishing the Laxmi Vilas Palace care was taken to preserve the royal character and the spirit of the property. The furniture, furnishings, even the photographs and paintings on the walls reminded one of the gracious days of the Raj.